The second matchup of the season between No. 14 UCF and No. 20 Memphis was nothing like the first, as the Knights needed double overtime to outlast the Tigers 62-55, winning the AAC Championship. The Knights (12-0, 8-0 AAC) came into Saturday with the nation’s No. 1 scoring offense, while the Tigers (10-2, 7-1 AAC) came in at No. 2. So, as expected, Saturday’s meeting between the two teams was all about offense. The two units combined for a total of 117 points and 1,479 yards of offense, but it was a defensive play that made all the difference in the second overtime. After the two teams traded touchdowns in the first overtime, UCF went up by seven on a one-yard touchdown run from freshman Otis Anderson. Then, after Memphis converted a key fourth down, the Knights finished the game off with an interception by junior Tre Neal. Before the game got to overtime, the two teams shifted momentum back and forth in a wild final 10 minutes. UCF led 48-34 with 9:51 left, but Memphis came fighting back. Sophomore Tony Pollard ran for a 66-yard touchdown with 9:02 left before senior Riley Ferguson found senior Anthony Miller for a 10-yard touchdown with 4:13 to go, knotting the game at 48. After a Knights punt, the Tigers drove down the field and set up for a potential game-winning field goal with just over 30 seconds on the clock. The attempt was initially blocked, but a delay of game penalty prior to the snap gave Memphis another shot. With the field goal pushed five yards back, the next attempt went wide left, sending the game to overtime. Each offense found the end zone to start overtime before the Knights got the score and stop they needed to win their fifth ever conference championship, and third since joining the AAC in 2013. What we learned: The Knights really did have it in them to shrug off distractions, remain focused and put together yet another impressive effort to push their record to 12-0. With all of the speculation throughout the week about Frost’s future and the pressure to beat a very good Memphis team for a second time, it wasn’t an easy week. However, UCF has been through plenty of adversity already this season. It wasn’t the least bit easy, but UCF was able to beat Memphis a second time. 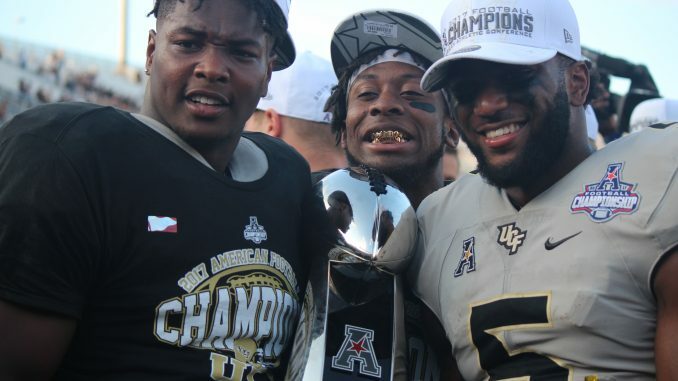 And as hard as it might have been to block out the noise about Frost’s departure, the Knights were able to do it and remain perfect on their way to their third AAC championship since 2013. What went right: UCF’s offensive turnaround was evident once again on Saturday, as the unit put together a 62-point, 726-yard performance. One season after the defense led the way in just about every game, the Knights have been able to rely on their offense all year long. The Knights went over 60 points for the fourth time this season and over 30 points for the 12th time. What went wrong: The defense played another rough game, struggling to stop another potent offense. Ferguson threw for 471 yards and four touchdowns, while the Tigers combined for 325 rushing yards. This came one week after UCF allowed over 600 yards to USF quarterback Quinton Flowers. Despite the struggles, UCF had just enough in it to come up with the necessary stop to win the game. It doesn’t show in the game’s final score, but the unit did force turnovers and get to the quarterback, making life difficult for Ferguson on multiple occasions. With the rise of the Knights’ offense this year, the defense hasn’t had to put on the same stingy performances as it did last year. Offensive players of the game: McKenzie Milton, Tre’Quan Smith and Dredrick Snelson. It isn’t possible to pinpoint one player that decided this game for UCF. Milton completed 28 of his 40 passes for 494 yards and five touchdowns, while adding 64 yards and a touchdown on the ground. He now owns the program records for most passing yards and passing touchdowns in a single season. Smith continued to be cement himself as one of the top receivers in UCF history, catching six passes for 161 yards and two touchdowns. Snelson, despite an early fumble, led the receiving corps with nine catches, 145 yards and two touchdowns. Defensive player of the game: Shaquem Griffin. In his final game at Spectrum Stadium, the redshirt senior was the best defensive player on the field. He recovered an early fumble to set up UCF’s first touchdown of the afternoon, then later added two sacks. Just saw your story @Shaquemgriffin. incredible stuff and a true inspiration man! Wishing you all the best and looking forward to watching you today! With the victory, UCF earned a New Year’s Six bowl bid. The official destination will be announced on Sunday afternoon.